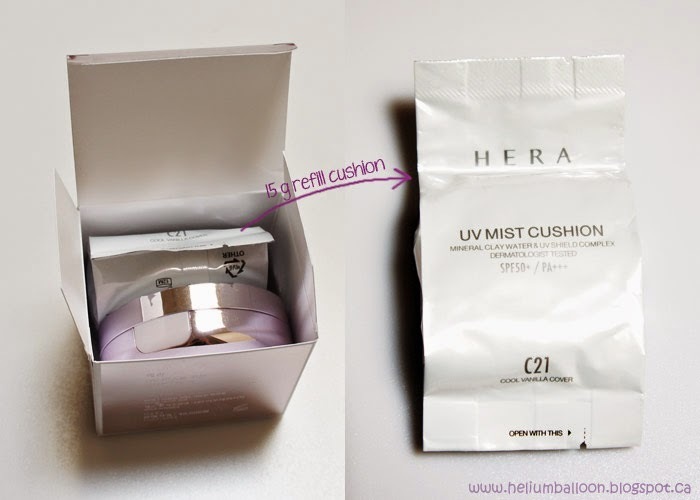 As some of you may know, HERA UV Mist Cushion Foundation is my current all-time favourite make-up base. 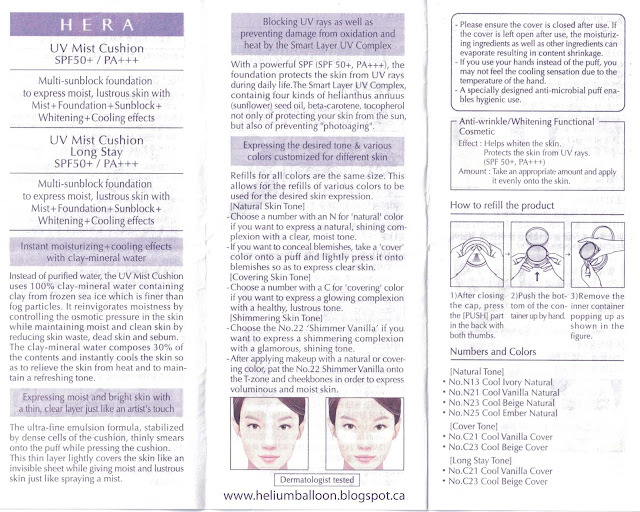 Cushion products originated from South Korea and has been a trend-setter in the makeup industry since its debut. 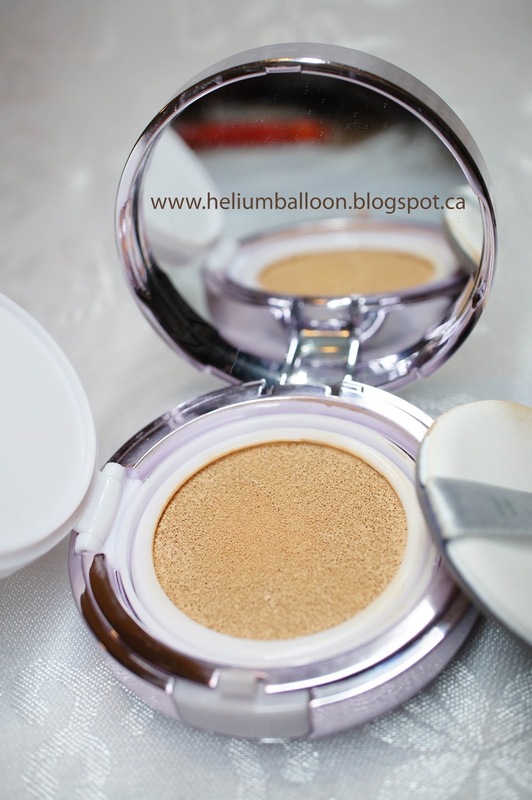 If you are unfamiliar with cushion foundations, it's basically foundation absorbed in a sponge (hence "cushion"), applied with a polyurethane 'air' puff packaged in a compact. They are raved to be "light-weight", "portable" and provide an "even finish' by reviewers and beauty youtubers. Every Korean cosmetic brand now produces their own versions of cushion products, ranging from liquid foundation, BB/CC cream, to blush and lip colour. Just last weekend, the lady working at the Dior counter in my local mall was telling me about an upcoming cushion product. 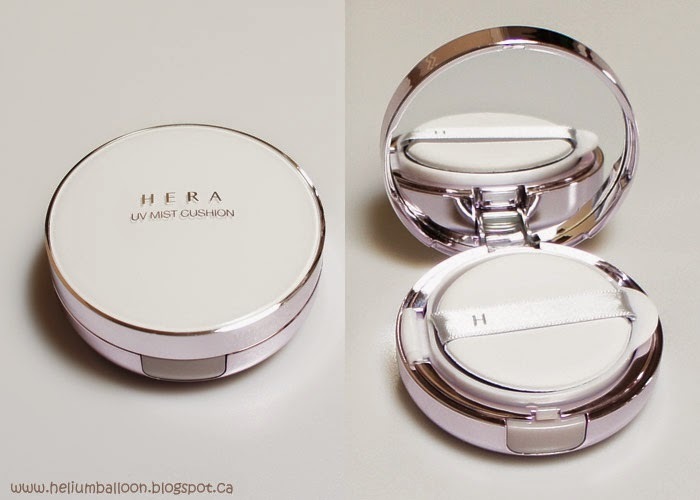 I choose the HERA UV Mist Cushion Foundation because of its medium coverage, staying power and semi-dewy finish. I ended up buying both the regular version in C21 Cool Vanilla Cover, and Summer Long Stay versions in C23 Cool Beige Cover. 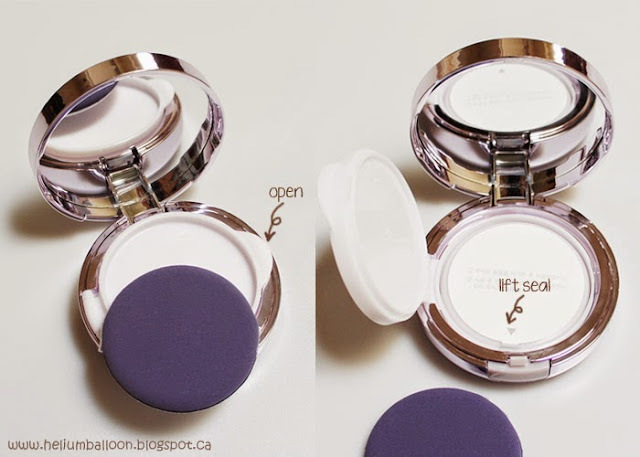 Full Compact with refill priced at 45,000 won; Refill only priced at 20,000 won. According to the box, this foundation is formulated with mineral clay water for hydration and smart layer UV complex for SPF50+/PA+++ protection. It also claims to have 12 hour long-lasting effect. Below is the information brochure scans with details on what the product promises to deliver, product range, and how to refill the product. Like the HERA Daily Mate Sunscreen, the UV Mist Cushion is frikin' gorgeous! Right from the get go, the reflective purple/lilac box gives a modern yet feminine feel. The compact has a lilac metallic finishing around the casing, and the top is pearly white with the brand and product name printed in white. The air puff included in the compact (and also with the refill) has very fine pores and is extremely smooth. Just take a look at these unboxing photos! Each full set comes with 15g of product sealed and ready to use in the compact, and another 15g air-tight refill. voila! what the cushion looks like (this is C21). It also has a large mirror! To apply the cushion product, hold the puff with three fingers and press down on the sponge cushion (not too hard and too much, especially when it's new) to pick up some foundation. Apply the product to your face with gentle patting motion. For more coverage, pat another thin layer where needed. The HERA UV Mist cushion Cover version delivers a moist, natural and medium coverage finish on my combination-oily skin. The feeling is light, hydrating, and very comfortable for daily (and extended hours of) wear. 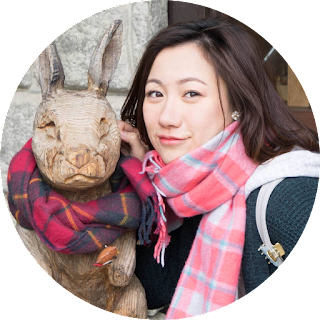 It does disappear a little bit on the bridge of my nose after 3-4 hours where it tends to get oily, but with some blotting, retouching can be done in a matter of 30 seconds. In hot/humid conditions (which is rare for Toronto climate) it can crease a little bit in expression lines, but with a good primer the foundation is weather-proof. After a typical day at work, moving around in a large building, it lasts a pretty good 8 hours. The Summer Long Stay version did last longer in the summer (duh!) but still delivered that semi-dewy, natural finish. I wore it out biking for a couple of hours one summer evening last year (just to test it out) and my face had a even healthier glow after the workout. 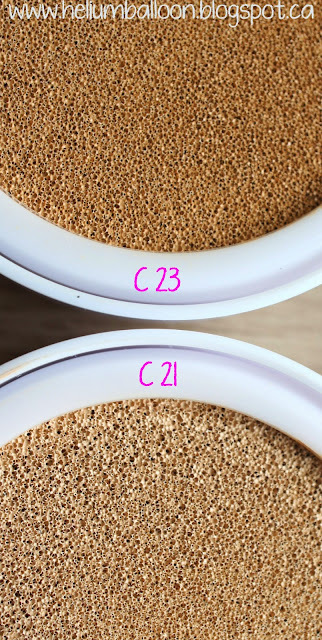 During my humble years of experimenting with makeup, I find Korean shades in BB/CC cream and cushion foundation very limiting, and tend to be a tone fairer than western brands. What may sound like a good choice for you online (e.g. 'natural beige') may be a real mismatch and likely end up making you look pale. This was the case for me with the shade Cover 21. It was great on the cheeks but visibly lighter on the rest of my face. It's not awfully noticeable though, especially after half an hour of wear. 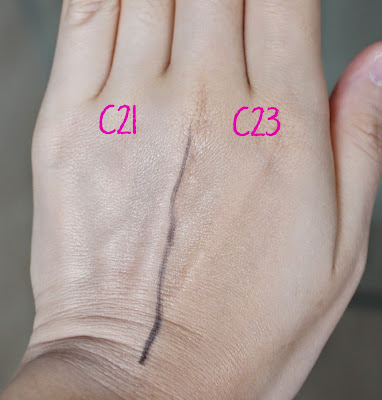 The shade 23 Cool Beige has a yellower undertone to it and it matched most areas on my face except the cheeks, where the yellow hue tend to show a bit more upon application. Again it's not noticeable. When I have the luxury of time, I pat on C23 leaving the cheek and bridge of the nose for C21. 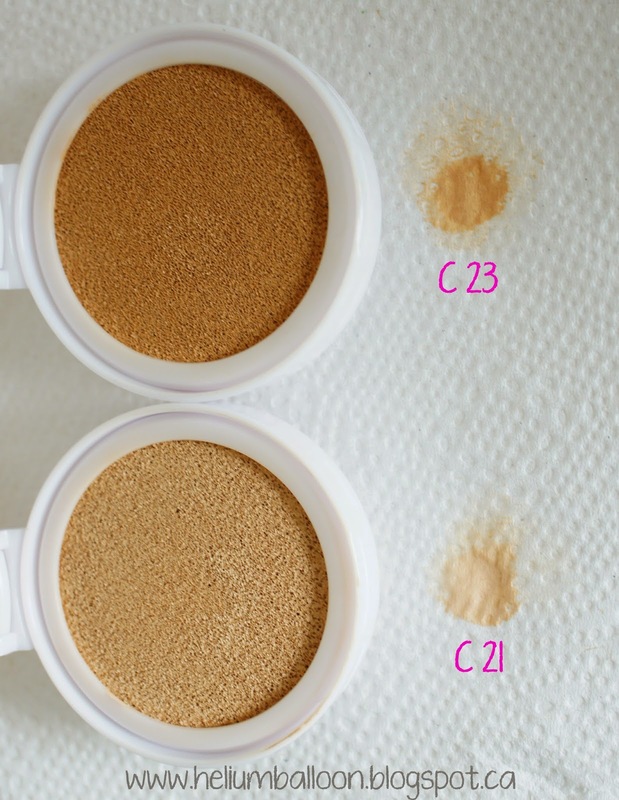 Since I have ran out of C23, I now use contouring powder with C21 to bring more natural shades to the edge of my face. I love this product from HERA! With simple "pat pat pat" my base makeup is done in literally under a minute each morning. One layer provides medium coverage and is definitely buildable. Every thing from the packaging, quality of the product, makeup effect and scent has won me over. The only downside to this product is the slight fairness of color no.21 to my natural skin tone. Until I find a product that performs as well as this one and also perfectly matches my skin tone, I will definitely repurchase again! I bought my cushion from Alice of w2beauty. You can register with my sponsorship code 261149605 to receive $5 off your purchase! Thanks for your review. very informative! just bought mine on shade c21. Did the shade match you well?